What if the controller for your industrial embedded application was available off-the-shelf and all you needed was some software developed? The core of what we’re suggesting is using an NI CompactRIO (cRIO) with C Series modules for hardware, overlaid with custom software that Viewpoint would develop for your application. If you’ve got an industrial monitoring or control need where these 4 criteria sound similar to your scenario, this could be an option worth your consideration. There’s likely going to be a cross-over point where the unit cost dominates the conversation vs the NRE. That cross-over point will depend on how much your scenario values time-to-market, flexibility of hardware configuration, and obsolescence management, but generally speaking the conversation will start coming into play in the ~30-100 units/year sort of range. There are size constraints. The cRIO does come in different sizes: see here, and here for a couple examples. There are power constraints. Again, the cRIO has different power utilization needs based on things like processor architecture, processor utilization, and I/O module needs. A power budget should be constructed for your scenario. See here for some additional info. If this isn’t a good fit for your scenario, we have the ability to develop hybrid solutions that combine a daughter board with an off-the-shelf core controller (see here). If you need a full custom board design built around a microcontroller or FPGA, you’ll likely want to look elsewhere. If you want to start by just collecting some raw data, that can probably be accomplished within a day or two after receiving your hardware. End-application development timelines can be drastically reduced using the cRIO platform because of the availability of high-level software functions. If, during development, it turns out you need more/different inputs or outputs, you can just add/swap out a C Series module or more (assuming what you need exists of course). With ~100 C Series modules, the breadth of functionality for interfacing with the world is pretty comprehensive. You can measure temperature, strain, acceleration, voltage, sound, current, and various digital voltage levels. 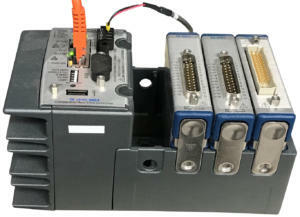 There’s also control interfaces for motion control as well as general voltage and current outputs. Check out the modules here: CompactRIO IO (be sure to check compatibility with the controller). Whether you need to interface to a touch panel PC or a thin client browser interface, there are several options. See Displays and Data Visualization With CompactRIO: The Ultimate Multipurpose Controller for more detail. There are two main methods for synchronization: (1) GPS and (2) TSN (Time Sensitive Networking). Yes, everything in the electronics world goes obsolete. This is really a question of how deeply you want to be involved in managing the obsolescence of your hardware. Do you want to manage it at the chip level (e.g. power regulators, switches, Ethernet interfaces, processors, memory chips), or at the controller level? Remember there’s low level software function compatibility to consider here as well. The standard way to communicate with a cRIO is Ethernet. Some cRIOs have multiple Ethernet ports in order to connect to a business network separate from a control network (IT vs OT), and sometimes daisy chain cRIOs by passing messages. There are C Series modules available to communicate via Wi-Fi or cellular (3rd party) connections for remote operation. Configurable software – that’s basically a given in most scenarios these days, so we won’t say more. Configurable hardware – maybe you’ve got a few variants of your product: a baseline model, a high-end model, and a model you’re experimenting with. The beauty here is that you can just plug in the C Series modules you need for the I/O of interest. You can even utilize different controllers (provided it’s got the horsepower and specs you need), although caution needs to be exercised because this can become a configuration management nightmare real quick. This term is very nebulous without some specs to back it up. There are multiple variants of the cRIO, with varying specs. See here for a white paper from NI: Reduce Risk with the CompactRIO Platform. All of this capability needs software developed for your application (as well as have the correct hardware selected). Our theory is that we can get you up and running faster and cheaper developing software around off-the-shelf hardware than going the full custom approach. If you’d like to see if that’s true for your scenario, reach out to chat. Industrial Embedded System Design Services – How much does it cost to prototype? Want to see some case studies where we’ve utilized the cRIO for industrial embedded applications? The maintenance of the equipment was not always done at the prescribed intervals because the cost of shutting down the plant is significant. This sometimes resulted in an equipment failure. 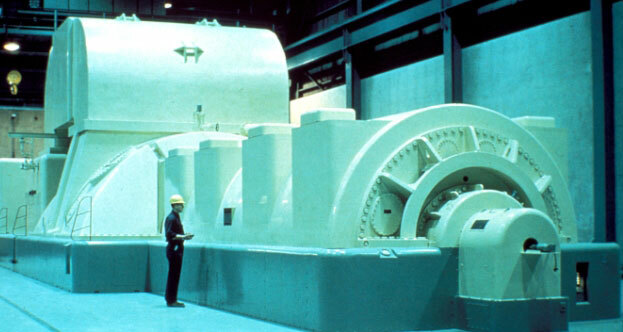 This particular application is for equipment/machinery in the energy/power industry (a generator). The online monitoring system monitors a particular parameter of interest to send warnings and alarms to the control room so that the operators know when maintenance needs to be performed on the particular part of interest. 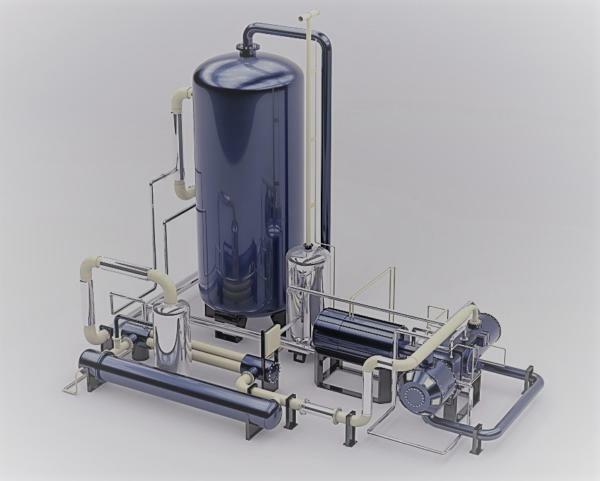 This system has been installed in multiple plants. The system monitors the generator collector health. NI-based data acquisition hardware acquires the signal of interest, logs the raw data, processes the parameter of interest, and triggers/sends warnings and alarms to the control room. LabVIEW FPGA was used for analog and digital IO and a sensor check. LabVIEW Real Time was used for the calculation, data logging, serving data to the HMI and alarm/warning checking. A manufacturer of large industrial mission-critical equipment in the electrical energy / power industry. The solution is a multi-node (i.e. 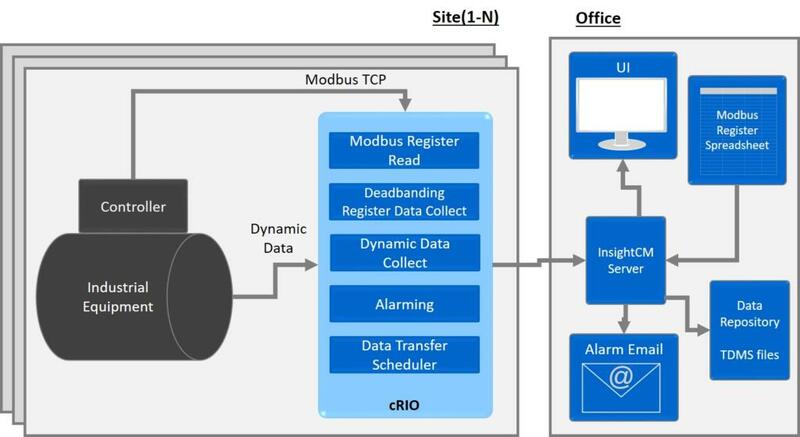 multi-site) remote monitoring system that utilizes an NI cRIO-based controller with customized NI InsightCM monitoring software. The remote monitoring system monitors equipment condition by taking several vibration signal measurements along with reading over 500 Modbus registers. 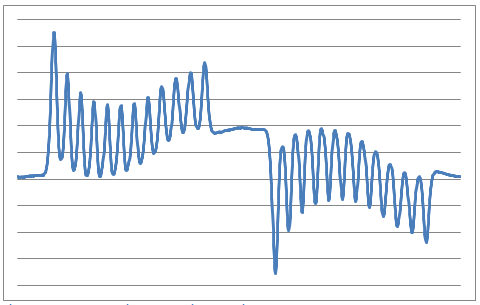 Local InsightCM vibration analysis on the cRIO extracts key features from the accelerometer data. Limit detection is run on these features and other equipment state and alarms are triggered when data is out of bounds. Information collected at multiple sites is sent to a central location either at periodic intervals or based on an alarm condition. Utilize laser energy to heat thermoplastic or thermoset composite during an automated fiber placement manufacturing process. 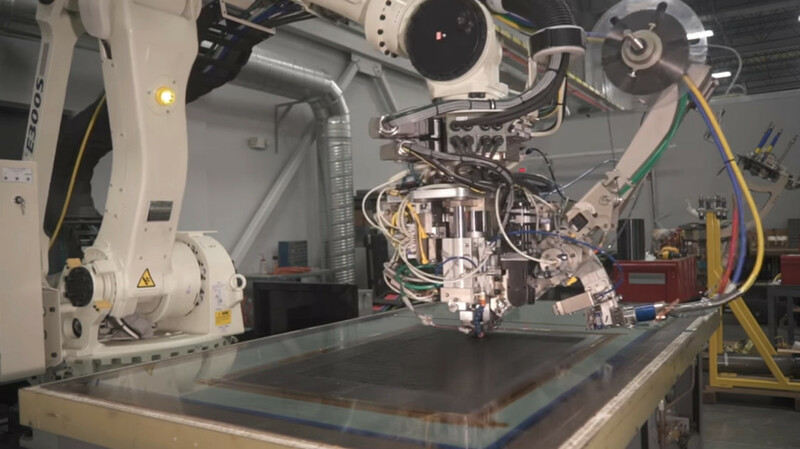 Starting from a proof of concept developed by Automated Dynamics, Viewpoint developed the industrial embedded laser controller software for the automated fiber placement manufacturing equipment. 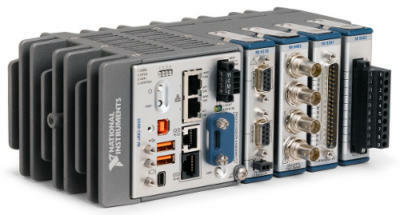 The hardware utilized was an off-the-shelf CompactRIO controller from National Instruments. Client – Quantum Engineered Products Inc.
Quantum produces manufacturing machine components that are used in the glass bottle forming process. Specifically, they supply plunger mechanisms that are used in the initial blank side formation of the glass bottle. The engineers at Quantum recognized that they had an opportunity to improve the bottle formation process by adding position sensing to their plunger mechanisms. The ability to sense and record plunger positions would enable machine operators to monitor the travel of the Quantum plunger into the molten glass gob within the blank side mold, identify and diagnose potential hardware problems, and provide real-time feedback that could be used to better control the process. Quantum needed a partner to implement real-time control and monitoring of the bottle forming process and selected Viewpoint for the task. Viewpoint developed custom monitoring and control software that runs on off-the-shelf hardware. 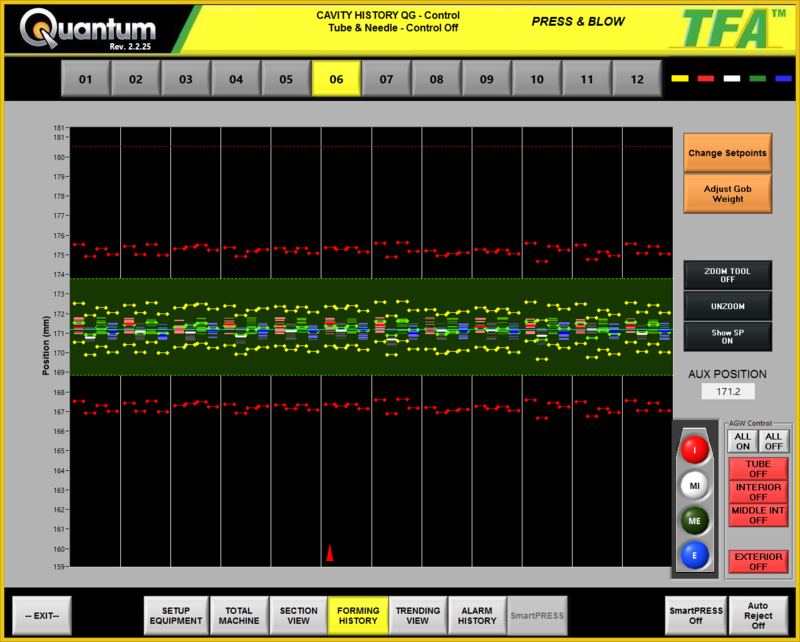 The software developed for Quantum is called TFA™ (Total Forming Analysis). 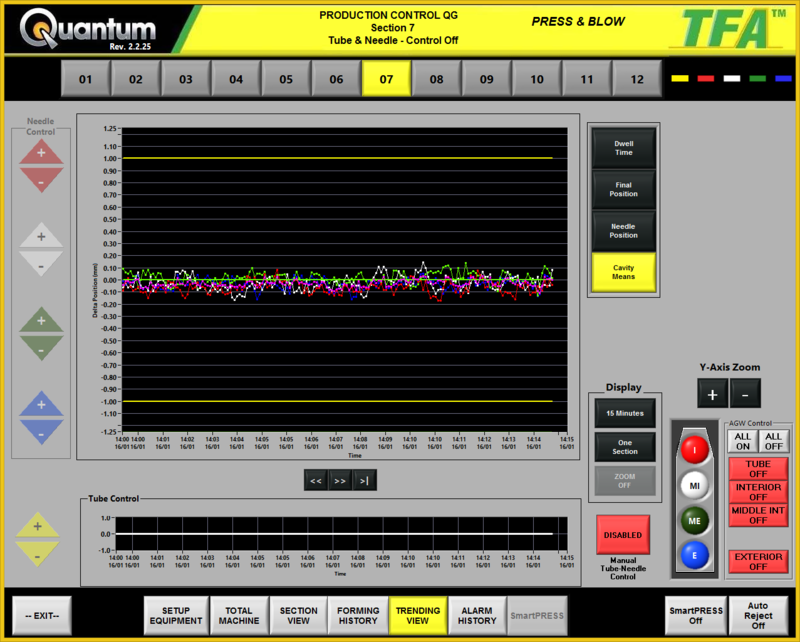 The TFA™ software is a process monitor and control system for the hot side of the bottle forming process. The software takes position information from the plungers Quantum supplies to the factories to show the travel of the tube during the forming process. The software measures key aspects of the plunger position profile such as initial plunger load position, final position, and dwell time at the final position. 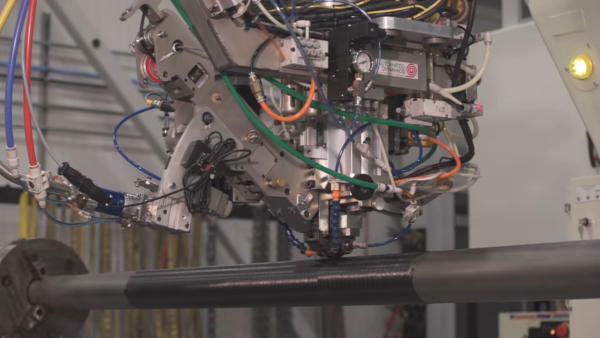 When these measurements are found to be out of tolerance, the software communicates with the machine auto-reject system to ensure that bad bottles are removed from the system. Moreover, the final plunger position is used as feedback to do closed loop control of the glass gob weight, controlling glass feeder tube height and/or needle heights to change the glass gob weight. This allows for precise control of container weight, making the most efficient use of raw materials while ensuring container quality. 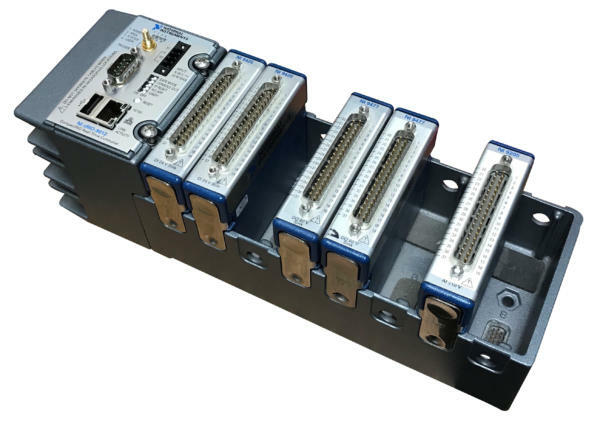 To accommodate multiple end-customer-driven hardware configurations, the off-the-shelf hardware selected was based on the National Instruments CompactRIO family of chassis to enable configuration of various input/output signal requirements. Hardware Customization Flexibility – every one of Quantum’s customers wants something either a little or a lot different with their particular instance of the system. Using modular hardware allowed for swapping of I/O hardware. Quick Response to Software Feature Requests – Quantum and Viewpoint were in constant communication to be able to implement new features and tweaks on fairly short notice (generally within a couple of weeks). On-Site Support – Viewpoint engineers travel to Quantum’s customer sites with them as a team upon request. The embedded process monitoring and control system consists of custom process monitoring and control software that runs on off-the-shelf hardware. TFA™ is a registered trademark of Quantum Engineered Products, Inc.
FPGA-based motor control & RT-based loop control. The NI cRIO platform allowed for rapid development/test cycles. There was as little as ~1.5 hours between a software change and a test. This was a rapid proof-of-concept prototyping effort to quickly determine feasibility of auto-pilot flight. 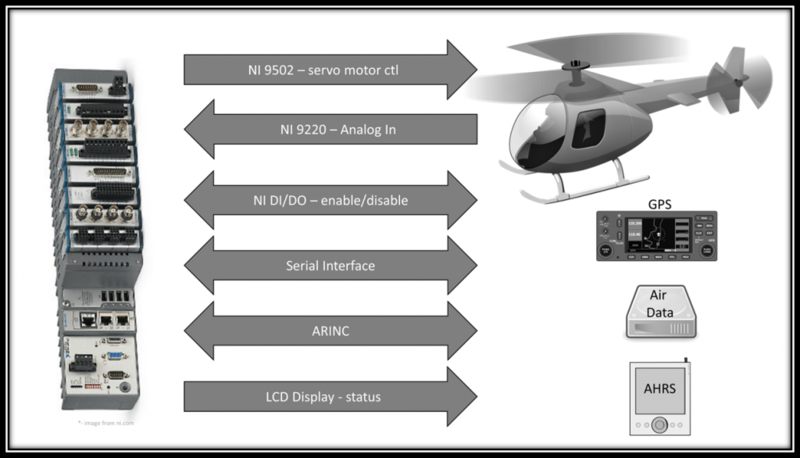 The cRIO-based controller was able to allow the helicopter to auto-pilot routed waypoints. The NI cRIO platform allowed for rapid development/test cycles. There was as little as ~an hour and a half time between a software change and flight test. Code updates could be flight tested in the morning, updated over lunch, tested again in the afternoon, updated one more time at night, and flown again the next morning. This allowed for rapid development of control laws. Vehicle dynamics control and position control lived on the RT processor, while motor control and critical high-speed processing lived on the FPGA. Client: A large industrial company that uses industrial-grade compressors. Increase awareness of potentially harmful operating conditions. Record detailed data upon event detection. Reduce unnecessary equipment shutdowns due to spurious vibration transients. We utilized an off-the-shelf controller (NI cRIO) combined with custom software in order to augment and create the first system with ~2 man-months of effort. This solution has been installed in several facilities and is projected to be installed in hundreds of facilities around the world. Send alerts via email when potentially harmful operating conditions occur. Record detailed data upon event detection for failure analysis and predictive maintenance. Suppress spurious vibration transient signals to reduce unnecessary equipment shutdowns. 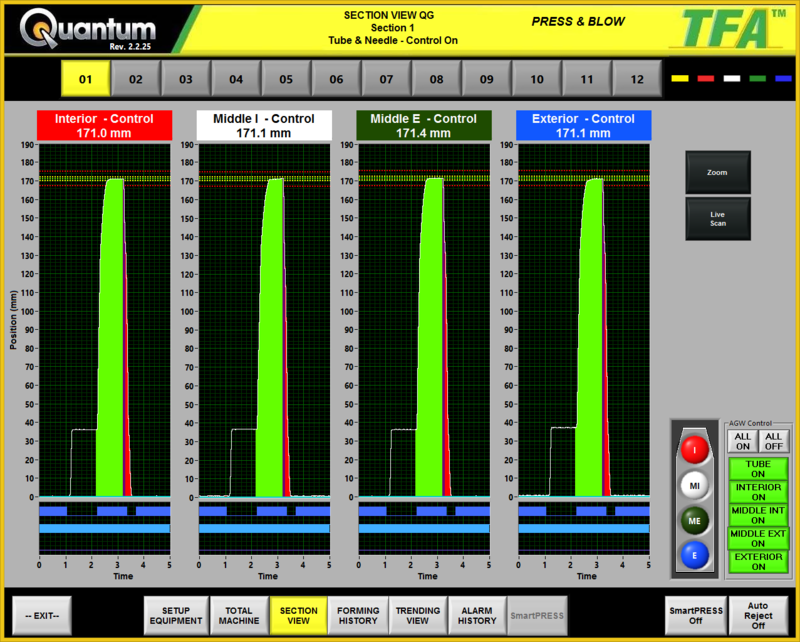 The CompactRIO-based system has allowed for continuous monitoring, rather than just a periodic review of turbine and generator performance. In addition, by combining the FPGA and the RT processor in a physically small device, the solution has been able to ensure very fast data acquisition, data reduction, and sophisticated analysis. Continuous monitoring of power generation equipment can have a great impact on maintaining a reliable flow of power to consumers as well as alerting the power generation equipment operator to potential equipment damage if timely repairs are not made. This case study will focus on two measurement systems utilized by a multi-national power generation equipment manufacturer to monitor the generator and turbine components of their power generation equipment. The manufacturer’s systems needed relatively high-speed waveform sampling, well-suited to the National Instruments CompactRIO platform. Viewpoint Systems provided technical assistance in the development of these systems. The difference in the types of analyses and data rates of the measurement systems required a flexible yet capable hardware platform. 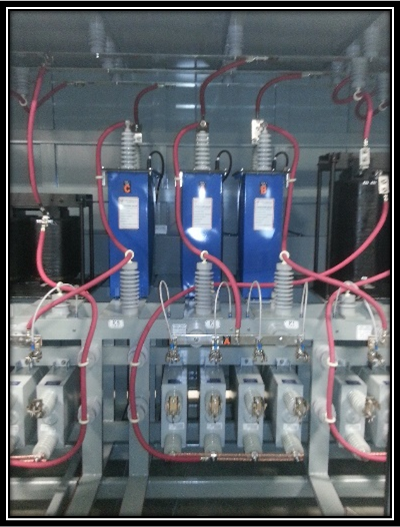 Each system needed to work on a generator outputting 50 Hz AC or 60 Hz AC. The CompactRIO platform and LabVIEW proved to be an excellent solution for the electric power generation condition monitoring system’s data acquisition and analysis needs. 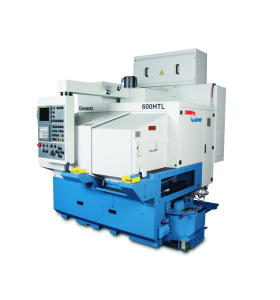 The small size and robustness of CompactRIO allowed the system to be placed at a preferred location. In both the flux probe and the blade tip timing, the CompactRIO FPGA could acquire and pre-process the data. The CompactRIO successfully managed – and continues to manage – all analysis, data archiving, and communication with a host PC. In the case of the tip timing, the data rates were high enough that the detection of the tip location for each signal needed to be performed in the FPGA so that the real-time (RT) layer received a much-reduced data rate of tip locations. The RT processor was able to perform higher level analyses on these timings. Occasionally, a snapshot of a raw tip timing waveform could be passed to the RT processor for archiving and presentation to an engineer. However, due to the data bandwidth and processor loading of the CompactRIO, such snapshots must be infrequent. For both systems, a master PC managed the operator user interface, long-term data collating, reporting, and archiving of files and statistics. Each CompactRIO connected to this master PC via a TCP/IP connection. 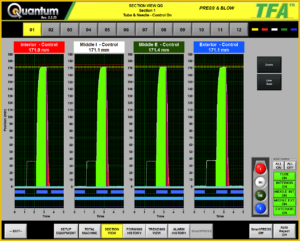 The CompactRIO-based system has allowed for continuous monitoring, rather than just a periodic review of turbine and generator performance. In addition, by combining the FPGA and the RT processor in a physically small device, the solution has been able to ensure very fast data acquisition, data reduction, and sophisticated analysis. By deploying CompactRIO devices, the multi-national power generation equipment manufacturer achieved a cost-effective method of monitoring the power generation facility equipment, ensuring detection of operational issues quickly and easily. Both measurement systems described required sampling rates greater than 10 kHz, restricting the use of traditional PLC-based data acquisition devices and requiring a programmable automation controller (PAC). Each system measured the performance by connecting to special sensors and associated signal conditioning, provided by our customer, such that the data acquisition equipment only needed to support ±10 V signals. Furthermore, each of these systems needed to push data to a master PC for data trending, result archiving, and operator display. Despite the significant differences in the measurement types, Viewpoint Systems was able to utilize a common set of data acquisition, processing, and connectivity tools, based on the NI CompactRIO platform and LabVIEW, to monitor the system. More information about each measurement system follows. The flux probe system looks for shorts in the windings of the generator. Each time a winding passes under the flux probe, the probe output increases. When a winding is shorted, the field created by the winding is reduced and detected as a lower amplitude output by the flux probe. The position of a shorted winding inside the generator can be located by measuring a key-phasor signal that pulses once per revolution and converting the timing offset of this weakened signal into an angular position. Both flux and key-phasor signals are measured at about 50 kS/s. Figure 1 shows an example signal output by a flux probe. The local peaks are indicative of winding current. Automated analysis of the amplitudes of the flux signals can be challenging due to changing waveform shape as a function of generator load and severity of shorts. The turbine tip timing system looks for displacement of each turbine blade tip from nominal position. At slow rotational speeds, the spacing between each tip closely follows the uniform blade spacing. At higher speeds, vibrations and resonances can make the blade tips wobble slightly, causing small deviations in the timing of the tip passing by a sensor. A special proximity sensor detects the tip of the turbine blade, and can be based on optical, eddy-current, microwave, and other techniques. Any positional deviations of a tip from nominal give indications about the mechanical forces on the blade as well as compliance of the blade to those forces as the blade ages. Specifically, each blade has natural resonances and compliance, both of which can change if the blade cracks. 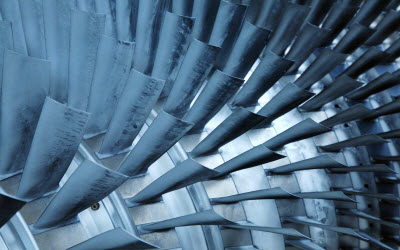 A turbine typically contains several stages and each stage contains many blades. See Figure 2 below for an example. The number of tip sensors per stage is variable; if blade twist is measured, at least two sensors are oriented perpendicular to the rotation direction. Also, the acquisition rate from each sensor is fast. For example, consider a stage with 60 blades, the width of each blade occupying about 1/10 the space between adjacent blades, and a generator running at 3600 RPM (60 Hz). The tip sensor would detect a pulse every 1/3600 s, lasting for less than about 1/36000 s, as the blades passed by. Accurate location of the pulse peak or zero-crossing then requires sample rates over 100 kS/s. Because multiple sensors are typically used, tip timing measurement systems can easily generate 10s of MBs of data per second. Client: T-Star Engineering & Technical Services: A manufacturer of electrical power delivery equipment. 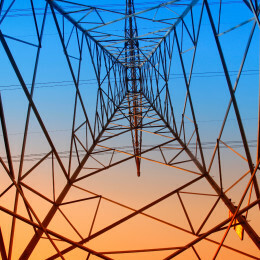 The U.S. power grid is a large electrical circuit that, although has some amount of isolation between loads, is certainly interconnected at drop points, which is what customers care about most. 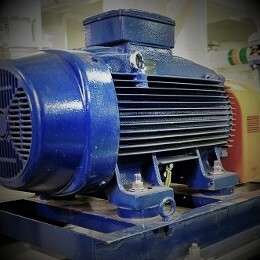 SVCs are generally worth considering in scenarios where large electric motors are being utilized (e.g. mills, recycling plants, mines). Problems such as voltage sag, voltage flicker, and current harmonics can cause reduced motor torque, lights to flicker, and equipment damage. T-Star has significant domain expertise in stabilizing medium voltage power systems. Viewpoint has significant domain expertise in the realm of measurement and control systems. The team at T-Star needed a well-supported intelligent device for their new generation Static VAR Compensator (SVC). They wanted a highly reliable solution that had minimized the time-to-market and a highly predictable future migration path for higher volume production. They also needed multi-channel precision timing, and high speed logging in a device certified for operation in dirty industrial environments. Viewpoint was asked to develop the controller for T-Star’s Static VAR Compensator (SVC) using a carefully constructed specification. The chosen controller platform is a National Instruments (NI) Compact RIO due to its modular feature set, networking capabilities, and associated supportability and quality that comes with an industrial-grade off-the-shelf controller. T-Star and Viewpoint have made very complementary GSD (Get Stuff Done) teammates. As the grid gains intelligence, this class of smart/dynamic power quality system will likely become more critical. The platform supports other future configurations that are outside the phase one scope of this project. Time-to-market is critical for T-Star. The initial proof of concept was completed in weeks. The Linux-based OS, well known in the embedded community, provides a rich ecosystem for enhanced usability (e.g. network stack), and real-time operation. Secure access through VPN with built-in firewall and user account control and permissions allows for remote diagnosis, health monitoring, and gathering of online information. An FPGA allows for deterministic timing and parallel processing. With COTS hardware, future upgrades are simplified with code base reuse and recompiling for new hardware. The NI platform provides a migration path to a lower-cost solution once hardware configurations are locked down and production volumes increase above a certain level. The NI control hardware is certified (certifications in the domains of CE, FCC, UL, etc.) for marine applications and other challenging environments. The SVC tunes a highly inductive load by dynamically injecting a variable amount of capacitance due to the measured load. 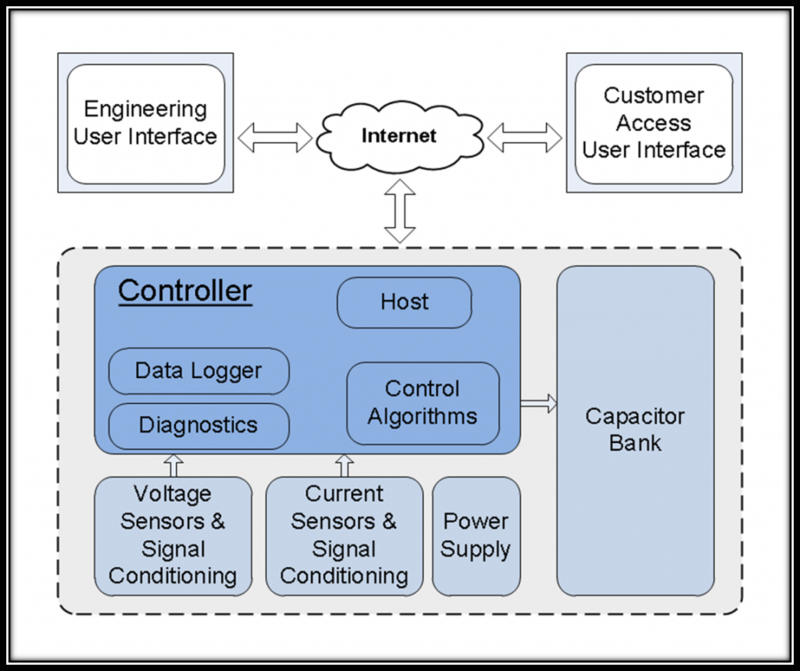 Voltage and current sensors feed a series of control algorithms which determine the voltage and current imbalance in order to inject the appropriate amount of capacitance into the power system. This algorithm acts on a cycle-by-cycle basis. The figure below illustrates the system makeup. VIEWPOINT SYSTEMS IMPROVES GEAR FINISHING USING REAL-TIME EMBEDDED CONTROL SYSTEM WITH NI RIO HARDWARE. quality and save cost at the same time. The Gleason Works sought to create a dynamic, torque-controlled lapping solution with responsive, realtime feedback to create better quality gears and reduce cycle time for its gear lapping machines. Viewpoint Systems provided system integration using NI RIO technology and LabVIEW FPGA code for real-time measurement and control. Gleason Corporation and The Gleason Works create the machines, tooling, processes, services, and technologies needed to produce the bevel and cylindrical gears found virtually everywhere – from automobiles and airplanes to trucks and tractors, and from giant wind turbines that can power a thousand homes to the lawn mowers and power tools found at these homes. Gear tooth surfaces and spacing are never perfectly machined, and consequently, noise and vibration are often present in applications where the gears are later used. Gears, after the typical heat treatment process, are commonly lapped or ground to smooth the gear teeth surfaces and improve operational characteristics. The goal of lapping is to reduce surface and tooth spacing deviations that may produce noisy gear sets. Gleason machines lap gears in pairs, the mating gear and pinion members rotating together at a high speed with an abrasive lapping slurry applied. 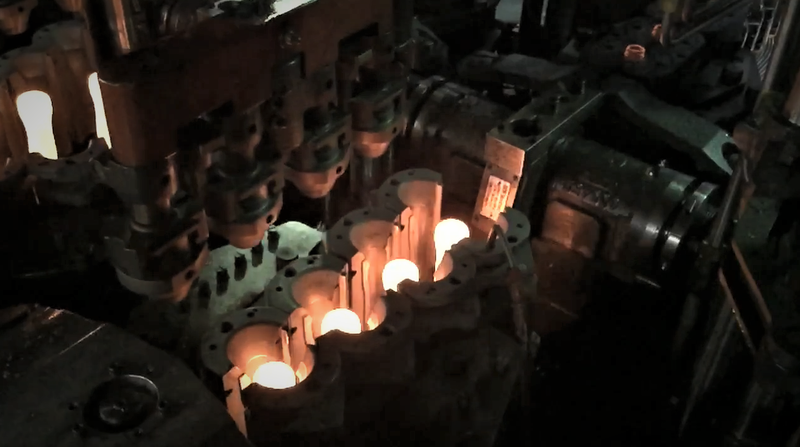 After machining and heat treatment, however, the spacing deviations that need to be lapped are at unknown locations on the gears and can show themselves as run-out (i.e., an off-center axis). To further complicate finding the deviations, the run-out is actually composed of multiple orders, likely making the run-out for each order different than the others. One conventional approach to lapping employs machines with relatively high-inertia spindles to carry the gearset members. At moderate speeds, this configuration can somewhat reduce spacing errors during lapping, but is far from optimal in refining the tooth surfaces. Another approach employs at least one low-inertia spindle. This configuration can refine tooth surfaces well, but tends to increase spacing errors—especially at higher speeds. In both conventional cases, one spindle is operated in a simple constant torque command mode to control lapping force, but the critically important dynamic torque components are left to passive physics. To get the best of both worlds, Gleason could no longer rely on passive physics, and turned to Viewpoint Systems to help develop and implement an embedded control system that could measure deviations in real-time and apply dynamic corrective torque. With this new, patent-pending system founded on embedded control and dynamic real-time process monitoring technologies, Gleason and Viewpoint bring exciting new capabilities to a worldwide and well-established gear finishing process. 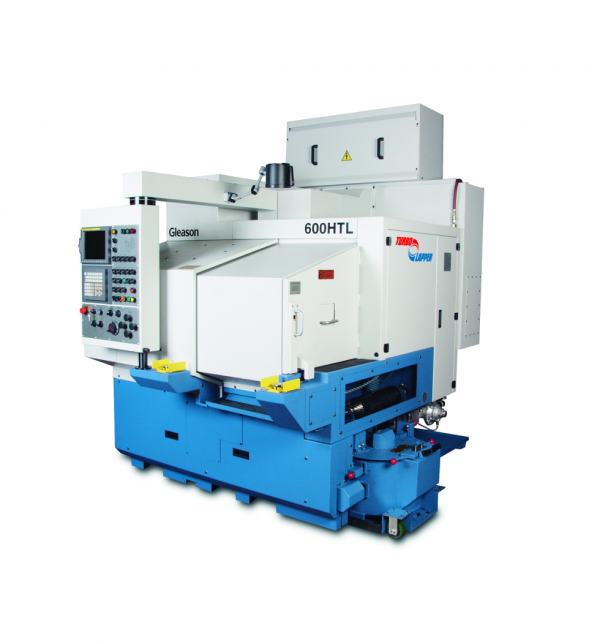 The unprecedented ability to improve gearset quality during lapping, and to do so at higher speeds provides a winning market proposition—one made possible by intelligent application of today’s leading-edge technologies. With its new solutions, Gleason gear manufacturing systems now produce higher quality gears in 30 percent less time. Throughout the process, Gleason appreciated Viewpoint’s expertise and synergy achieved when working together. More than just an implementer, Viewpoint’s experts worked alongside their own to develop new techniques and solutions in an agile and collaborative environment. Gleason engaged Viewpoint Systems to implement this real-time measurement and control system because of their expertise with the leading reconfigurable I/O (RIO) hardware from National Instruments. Viewpoint used the NI RIO technology and developed LabVIEW FPGA code to create a real-time measurement and control solution for the lapping machine. Viewpoint equipped an NI cRIO-9076 controller with an NI 9411 digital input (DI) module and an NI 9263 analog output (AO) module. The DI module monitors two digital rotational encoders, one on each spindle carrying the bevel gear set members. Innovative analysis of these angular signals can tease out subtle variations in the average rotational speed. Coupled with sophisticated order analysis, these variations are used to modify the torque applied to the gear set at the proper angular positions and with the appropriate amplitude. Thus, the high-frequency dynamic torque components experienced by the gearset during lapping are no longer dominated by passive physics, but are actively controlled to achieve desired results. Viewpoint created the system to manage all of the measurements, analyses, and torque corrections in the RIO FPGA with specific, efficient coding in LabVIEW FPGA using Viewpoint’s FPGA IP toolset. 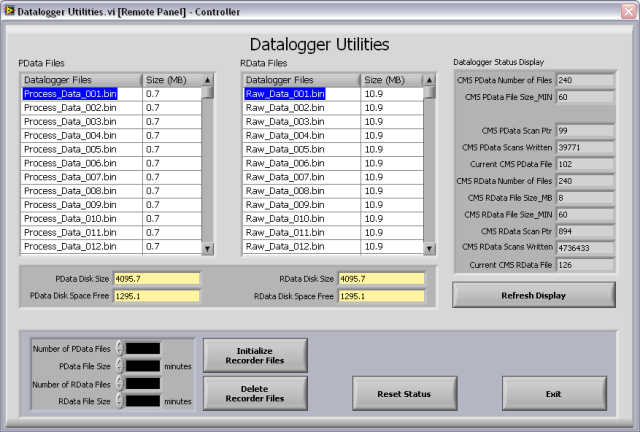 The cRIO controller provides data collection and even data archiving functions to support other advanced post-processing. The controller also provides an API to control the adaptive lapping process from a supervisory application. By connecting these systems with a host PC, we can monitor continuous vibration activity and alarm conditions on a variety of structures despite inclement weather. Continuously monitoring the structural health of the Long Island Railroad (LIRR) Viaduct despite the relative inaccessibility of the structure. Using CompactRIO, LabVIEW FPGA, and the LabVIEW Digital Filter Design Toolkit to measure the modal analysis of vibration data generated from ambient excitation, capture this data remotely, and analyze significant events. Engineers use structural vibrations to assess the conditions of many constructions and machines, including buildings, bridges, dams, towers, cranes, and mountings. Although we have had tools to monitor structural vibration for decades, these tools restrict data collection to short durations of high-fidelity waveforms or longer durations of summarized power in frequency band results. Many structures vibrate in meaningful ways only in the presence of ambient forces such as wind, vehicle activity, nearby construction, or random events such as earthquakes and tornados. Therefore, data collection needs to be active during these events. Due to recent improvements in memory storage, processor speed, and wideband wireless communications technology, we can collect high-fidelity waveforms over long periods. We can also communicate to host PCs that aggregate structural vibration data across multiple collection locations, providing permanent data collection and superior analysis and reporting capabilities. STRAAM Corporation, a leader in structural integrity assessment, and Viewpoint Systems, a Select National Instruments Alliance Partner, collaborated to develop a system that functions outdoors and in other less-accessible sites and maintains the capabilities of the available PC-based solution. 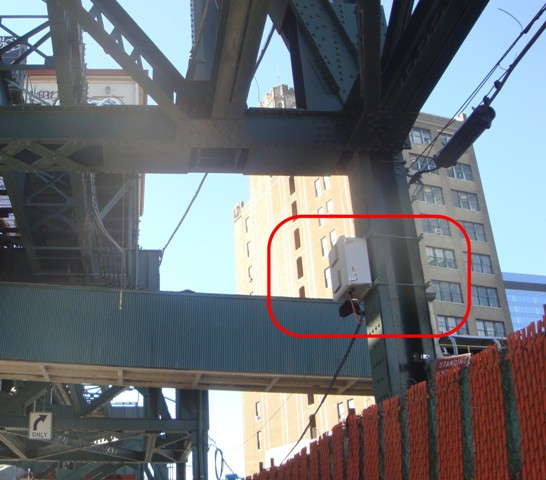 Ultimately, we produced an enhanced version of STRAAM’s SKG CMS™ system to install on a Long Island railroad bridge. 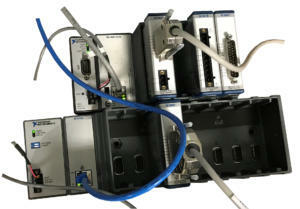 We chose a system based on the NI CompactRIO platform and dynamic signal acquisition (DSA) C Series modules. The CompactRIO and associated C Series signal conditioning modules have an operating temperature range of -40 to 70 °C, well within typical environmental extremes for most installation locations. 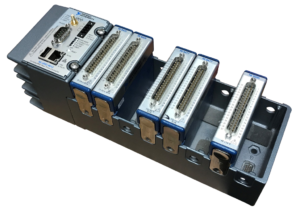 Additionally, the CompactRIO controller has no moving parts, increasing the mean time between failure and ensuring it can withstand physical mishandling during shipment and installation. For software, we decided to use the NI LabVIEW Real-Time Module and the LabVIEW FPGA Module. We used LabVIEW FPGA for basic signal acquisition as well as some custom antialiasing filtering to allow for sampling rates below the capabilities of the DSA module. The DSA module acquired acceleration signals via special sensors, supplied by STRAAM, that output information about tilt and acceleration. Because large structures resonate at low frequencies, it is important that these sensors have extremely low noise, high dynamic range, and low frequency response to gather information about structures at less than 1 Hz. The low frequency range and long-term data storage need combine to create a maximum data collection rate frequency of 200 samples per second (S/s). The NI 9239 does not sample that slowly due to its delta-sigma converter technology, so we sampled at 2,000 S/s and used lowpass digital filtering on the field-programmable gate array (FPGA) to produce an antialiased signal at 200 S/s. Simple subsampling through decimation would violate the Nyquist criterion. Using the LabVIEW Digital Filter Design Toolkit, we produced a 28-tap infinite impulse response (IIR) filter with a 3 dB roll-off at 0.8 times the sample rate with a stopband attenuation greater than 90 dB. The Digital Filter Design Toolkit includes tools to automatically generate code to deploy the filter to the FPGA. We carefully selected fixed-point arithmetic to ensure proper operation without using excessive FPGA resources. The final filter was a 24-bit fixed-point solution with a 4-bit mantissa. 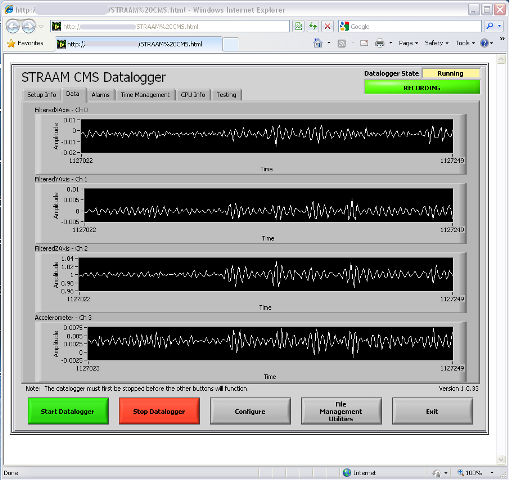 STRAAM uses proprietary analysis routines, based on the structure’s resonant frequencies, to extract relevant information from the continuous stream of acceleration data. Because ambient energy excites the structures, we analyzed some initial data to locate these resonances. After this initial period, we configured the CompactRIO to perform the proprietary analyses based on the location of these resonances. We handled all activity in this initial setup remotely via wireless communications. 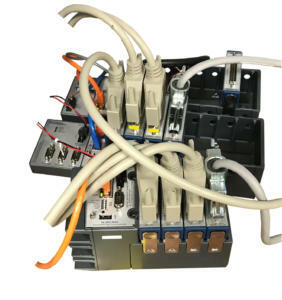 We connect to CompactRIO over a wireless connection, then to a LabVIEW remote panel where we initially acquire and assign resonance bands. The signal processing requires the spectral power and time-domain structure of the waveforms inside those resonant bands. The CompactRIO processor and FPGA module can calculate fast Fourier transform (FFT)-based power spectrums and perform time-domain filtering calculation so we can base calculations on the complicated algorithms provided by STRAAM. Furthermore, the large CompactRIO RAM can archive raw acceleration waveforms for later retrieval. The LabVIEW development environment greatly simplifies adjusting these calculations. We apply additional calculations to identify noteworthy events to alert the engineers when important conditions occur. These conditions may signify the presence of a meaningful ambient excitation or that considerable changes to the structure have occurred. In order to successfully operate, this system needs to communicate effectively to the host PC. Because the system is deployed in almost-inaccessible and outdoor locations, all interactions with the system should occur remotely. 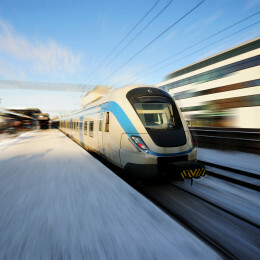 Using cellular modems, the system connects via TCP/IP to upload important information, issue event alerts, and allow remote configuration. We designed the LabVIEW application to send periodic summary information via custom binary messages to the host with information about the condition of the structure and the CompactRIO system. The host then tallies this information along with all other SKG CMS™ systems deployed in the field. In addition to this summary information, the host can pull raw waveform data from the CompactRIO RAM. To avoid tampering and unauthorized access, we password protected all connections. We have successfully installed several functional SKG CMS™ systems based on the CompactRIO platform. By connecting these systems with a host PC, we can monitor continuous vibration activity and alarm conditions on a variety of structures despite inclement weather. Our customers enjoy the benefits of modern Ethernet-driven, Web-based connectivity to verify the status of their structures and we enjoy the benefits of the rugged, reliable, low-cost, and reprogrammable CompactRIO system for data collection.